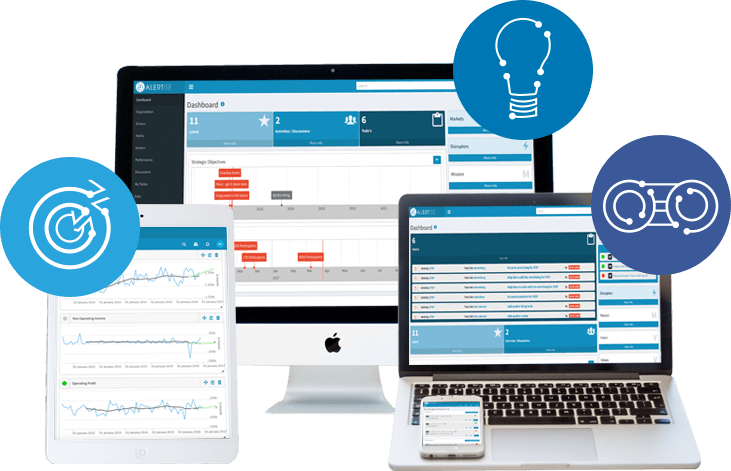 "Alertise gives us quick and easy visibility of our KPI’s, markets and the external factors that can have an impact on our business. Importantly for us, the platform gives us the intuitive tools we needed to bridge the gap between our strategic initiatives and the actions required to deliver them." "At Intelife, Alertise has gone from a metric dashboard tool, to a strategy reporting tool, to now being the software we run the business with. Our business strategy is now driving day to day actions and we even run our meetings with it." "In the first six months, Alertise quickly streamlined all our planning, reporting and communication processes. Previously team members were using various platforms for communicating project and KPI progress reports, leading to errors and double handling of tasks." Alertise is a web-based platform that helps you deploy your strategies more effectively. Access your market data, KPI's and strategic projects in one intuitive collaboration tool built for people tasked with creating and delivering strategies. Alertise makes strategy happen. Alertise makes it simple to continuously gather, store, and share information about the Strategic Drivers of your business. Alertise gives you easy access to your KPI's and enables you to execute your strategies using continuous Improvement techniques. Alertise leverages the agile project management methodology, to help your business turn its strategy into measurable strategic actions. Know how your organisation is performing (given the strategic conditions at the time). Better and more timely strategic decisions. Execute strategy using agile and continuous improvement mangement techiniques.